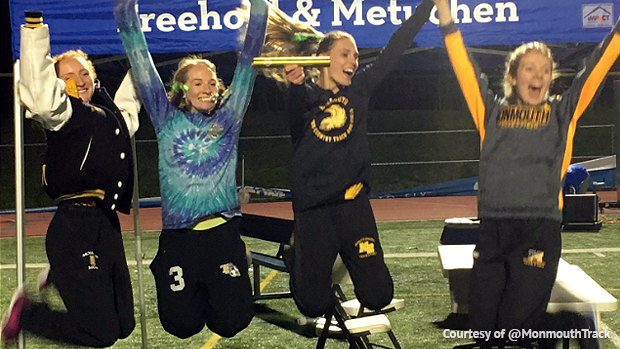 Some awesome racing took place Thursday night at Bob Roggy Memorial Stadium in Holmdel, NJ. While the chill in the air kept the crowd cold the competition on the track was hot and multiple teams brought in solid times including clinchers for Penn. One of the most exciting finishes of the day came in the seeded girls 4x800m where Monmouth Regional's Sydney Todd split a 2:17 to bring her team back from fourth and took over the lead in the final few meters of the race! The Monmouth Regional girls clocked in a NJ#3 time of 9:38.17, Samantha Ragenklint led off with a 2:23, Amanda Stone then went 2:20, and Faith Williams 2:34 on the third leg. Westfield girls were second at 9:40.68 NJ#5 and Metuchen third with 9:42.33, Metuchen already ranked NJ#2 from their 9:35 victory on opening weekend. Watch the Girls Seeded 4x800m race. The boys 4x800m race rewrote the young season's rankings giving us the NJ#1 through NJ#4 performances. Morris Hills ran a cool 8:00.00, yes they hit it right on the mark, to win the final race of the night. That moves the squad made up of Kevin McNally, Matt Morena, Matt Salazar, and Domenick Wallace up to NJ#4 and breaks into the top 25 nationally. Westfield NJ#2 with 8:01.10, Toms River North NJ#3 at 8:05.23, The Lawrenceville School 8:05.59 NJ#4, and Summit 8:06.98 NJ#6. The 4x8s weren't the only things moving on Thursday, the DMRs brought something for the crowd as well with great battles in both the boys and girls events. The boys race, which saw six teams under 10:40, was won by Kingsway with a NJ#1 US#16 time of 10:25.44. Camden Catholic came through second at 10:26 NJ#2, West Morris Central 10:31 NJ#3, Rancocas Valley 10:33 NJ#4, and Memorial WNY and Jackson Liberty fifth and sixth at 10:35. The girls DMR went to West Morris Central anchored by Julia Trethaway with a 12:20.21 NJ#2 after battling with Rumson-Fair Haven who finished second at 12:25.00 NJ#3. Randolph, 12:29, and Shawnee, 12:44, also bringing in top six NJ times. The sprints saw some dominant showings. 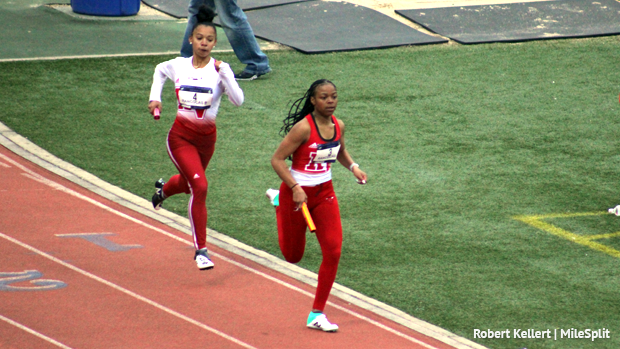 Rancocas Valley came to town with split-team squads and went 1-2 with an A and B team in the 4x400m running 4:04.82 and 4:06.34. They rank NJ#4 now and their B team would have been NJ#6! They once again went 1-2 with A and B teams in the 4x100m as well running 49.69 NJ#2 and 50.57. Their B team would rank NJ#9 as of Thursday night. Imagine when they run full force. The boys side had a clear winner in the 4x400m as well with Freehold Township running 3:23.17 NJ#1, over six seconds ahead of second place Snyder 3:29.58 NJ#10. The 4x100m was won by Ocean Twp at 43.30 over second place Elizabeth 43.39.